It makes sense that sunn O))) are named after Sunn amps, because the many Sunn amps onstage with them get a punishing workout during their sets. Raleigh’s Memorial Auditorium proved to be one of the most challenging rooms for bands at this year’s Hopscotch Music Festival; its size and cavernous design threatened to swallow the sound of several of the acts who played there. But for the doom metal pioneers and their slow, hypnotic wall of sound, the mid-sized auditorium was child’s play. 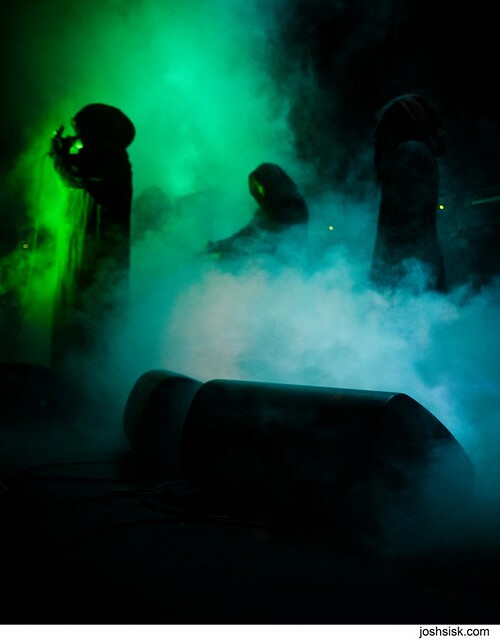 As they prefer it, sunn O))) took the stage shrouded in a wall of smoke, the silhouettes of the black robed players barely visible. 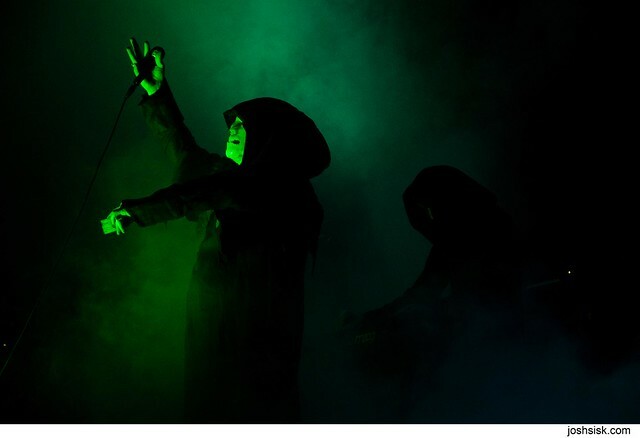 sunn O))) doesn’t need to give you much to see, though, as their music communicates on a more visceral level – that is, by rattling your guts with their bass-driven, low-tuned guitars and periodic paganistic chants. For this set, there was no percussion involved, and for the uninitiated, there were no obvious discernible songs – again, as the masters prefer it. A sunn O))) show is not so much as a “concert” as a holistic experience, as if you’ve joined the band in a dark ritual that will give them, for an hour and a half or so, your undivided attention and near-catatonic rapture. A scan of tweets during the show revealed a mixture of awe and fear among the show’s participants; sunn O))) is not for the faint of heart. The Hopscotch Festival was meant to reflect the impeccable and unique musical tastes of its co-founders, and I think it’s safe to say that co-founder Grayson Currin‘s predilection for “heaviest music” was satisfied by having sunn O))) close out the third successful run of this festival. I recorded this set with Schoeps MK5 cardiod microphones in the optimal location in the venue. This is an outstanding recording and perhaps my favorite quality-wise of the entire festival. Enjoy! If you enjoyed this recording, PLEASE SUPPORT sunn O))), visit their page at Southern Lord Records, and purchase their music there. You made this show sound so tasty and conveyed the experience of a Sunn 0))) show quite well. I’m looking forward to the recording, but, alas, the mp3 download link seems to be broken. Having been at the show, I was skeptical that *any* recording could come close to doing it justice. But you’re right, this is an outstanding capture. Amazing work. Thanks Ross! Nice meeting you BTW. Thank you very much for this and everything else. Thank you for recording and sharing. Saw them a few weeks ago at Warsaw and was floored! Looking forward to listening to your recording. Love this. You are doing The Lord’s work. AKA Greg Anderson. But still, many thanks for sharing! Tremendous recording – the FLAC version is very powerful – I literally feel like I am there!